Welcome to The Ohio Crybaby Bridge Project! What’s a Crybaby Bridge, you might ask? Well, you’ve come to the right place. Simply put, it’s the centerpiece of the Crybaby Bridge legend; a tale of unknown origin that has, over time, spread across most of the Continental United States to the point where almost every state claims to be the official home of at least one Crybaby Bridge. Once you have those ingredients, you mix them together and create a creepy story that ends with the baby’s death. You then add a brief postscript explaining that if people go to the bridge at a certain day and time, they will hear the ghostly cries of a baby. And there you have it; your very own Crybaby Bridge legend! If you’d like to dig a bit deeper into the lore surrounding Crybaby Bridges, Ken Summers wrote a great primer/backgrounder, which you can read by clicking here. 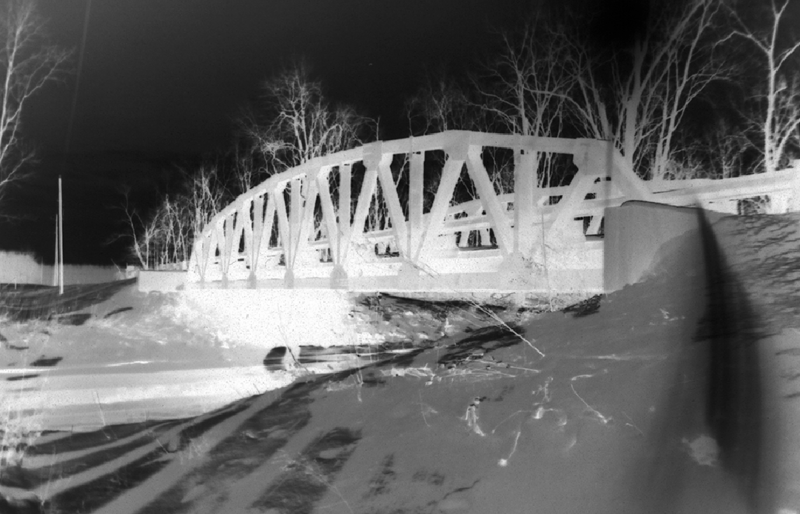 And now, let’s get back to the Ohio Crybaby Bridge Project, beginning with a wee bit of background as to what got me started. Growing up in New York, I was familiar with Crybaby Bridges as there were rumors of 4 in the state (that I was aware of). In the early 90s, I relocated to Georgia and wouldn’t you know it, that state had a couple of Crybaby Bridges, too. At that point, all I really did was chuckle at the similarities between the NY and GA stories. It wasn’t until I moved to Ohio in 1999 that I realized something: not only did the Buckeye State have Crybaby Bridges, too, but they seemed to have cornered the market on them! And when I started trying to chronicle them for the book, Weird Ohio, I was stunned to find that there were literally dozens upon dozens of Crybaby Bridges legends throughout the state. What’s more, they weren’t limited to just bridges. Ohioans can proudly proclaim that our state is home to Crybaby Tunnels, Crybaby Hollows, Crybaby Lanes, and even a Crybaby Cemetery! There were so many that it became hard to keep track. And that, my friends, is what led me to create the Ohio Crybaby Bridge Project! I wanted people, not just in Ohio, to have one central location where they could read to their heart’s content about all the Crybaby Bridge legends in the Buckeye State. 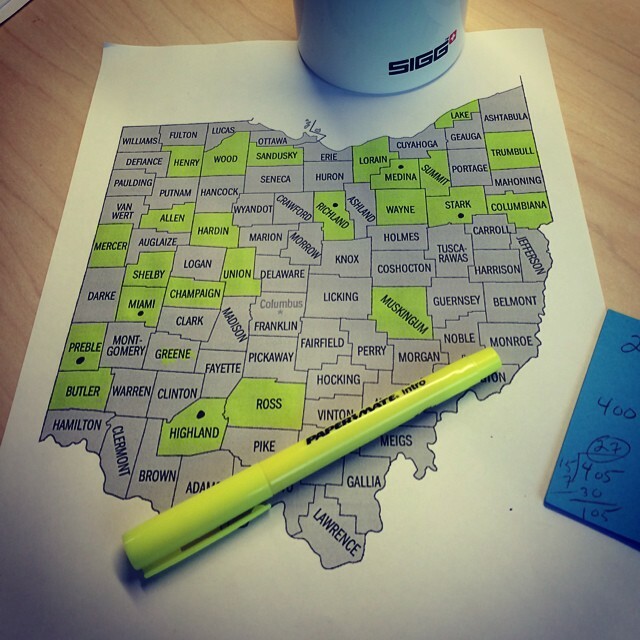 Personally, when I look at all the different versions in Ohio, I’m fascinated with how you can almost track the basic legend as it mutates and crawls across the state. Map highlighting all the Ohio counties where I have confirmed the existence of a Crybaby Bridge. Black dots represent multiple bridges confirmed within the county. Is it a covered bridge? Foot bridge? A train trestle, perhaps? What is said to have happened on the bridge that resulted in the haunting? No, we’re not talking about boiling cauldrons here. It’s more along the lines of describing anything specific one would need to do in order to hear the baby cry. Do you have to flash your headlights? Honk your horn? Or maybe you just need to be there at a specific time and date. Where the bridge is said to be or, in the cases where the bridge has been demolished or removed, where it once stood. My personal thoughts on the legend. May sound a bit arrogant, but this is my site, after all! Plus, I did manage to uncover all sorts of meaningless bits of trivia related to some of these bridges, including how the legends got started. So if nothing else, it will be interesting bits of meaningless trivia! Other places where you can read about the bridge, including online resources. At this point, you’re probably dying to get started, but I’ve saved the most important point for last: please use common sense if you decide to visit any of these Crybaby Bridges. If you’ve been reading along, you’ll notice that I said the point of this project was simply to chronicle the history of Crybaby Legends in Ohio. It is NOT intended to be taken as my proclamation that any of these locations are indeed haunted. If anything, there is absolutely no concrete evidence to substantiate the alleged hauntings at close to 95% of the locations. I can’t stress that fact enough because the last thing I want is any of you climbing onto these bridges in the dead of night with your EMFs and digital cameras, trying to capture ghostly evidence. Also, please keep in mind that most of these locations are active in that there will be everything from vehicles to trains using them, so please don’t put yourself in danger trying to find something that probably isn’t there to begin with. Oh yeah, and while it probably should go without saying that it’s not a good idea to do things like stopping your vehicle on a bridge and turning all the lights off in the middle of the night, I’ll say it anyway. Don’t do it! And while I’m at it, don’t forget that some of these locations are on private property and/or right next to private property. Please respect people’s right to privacy and do not trespass under any circumstances. OK, thanks for reading all this. Ready? To access individual entries of the Crybaby Bridge Project, you can use the pulldown menu by rolling over the “Crybaby” tab at the top of this page. Or you can always click on any of the links below–and don’t panic if a link isn’t live yet. I’m constantly updating, so it will be soon! Either way, be safe, enjoy the journey, and don’t forget to listen for the baby’s cries! With regards to the Philo crybaby bridge, I am not familiar with the story and I grew up in the area. (And graduated from Philo High School) I would recommend finding out when the story originated and whether or not it involves the current bridge. My understanding is that when the current bridge was built, it replaced another one that was not in the same spot. There are talks of replacing the current bridge in a similar manner. Tim, thanks for the note! And you’ve hit on one of the most fascinating (and frustrating) aspect of these Crybaby Bridge legends. Namely, how the legends got started and what caused them to mutate over the years. Since you mentioned growing up in the area (and are unfamiliar with the legend), I’d love to chat with you in more detail to see if it might help me better pinpoint when this legend got started. Please feel free to drop me a line at jim@strangeandspooky.com and we’ll see if we can get to the bottom of this. And again, thanks for writing! There is also a Crybaby Bridge in Clark County just outside of Pitchin. Might want to add this to your list. Pitchin was the bridge very well known to us growing up. Listen for the baby to cry!!!! Also beware of the devil worshipers. I too have grown up and live in the area. I remember people being very vague of how it is “haunted” but never the story or legend behind it. However, until recently with our Philo group, I wasn’t even aware of the drownings that initated the Philo pool project. Amanda, thank you for the kind words. Glad you’re enjoying the new pages! And you hit the nail on the head with your “people being very vague” comment. Seems to be a common thread with these types of stories/legends! You mentioned your “group”. If you have been to the bridge or done any sort of research into it, please feel free to shoot me an e-mail at jim@strangeandspooky.com. I’d love to add any additional information/insights you guys might have to the Philo page! I recently reached out to a very informative lady who has lived locally for as long as I can remember. She has helped run our village pool for many years. I confirmed with her that a young boy, Larry Moyer, did die in the river in the 50’s. I know it is very little information but it is a start for something I have recently become extremely interested in. We have a couple of pages for Philo, one is regarding the bridge itself as it is has been undergoing construction and evaluation of a possible future move. Our page contains a lot of history regarding the original bridge and when the bridge moved to its current location, and updates as the engineers office allows them for the future of the bridge. I think all of us locals have been to the bridge and the locks, I live about a 1/2 mile, if that, away from the bridge. I have never personally heard anything strange, but then again, I have only walked it or went down to the locks or the dam during the day and usually with a loud group of people. It is a unique location to visit if you are ever able to do so. I would be happy to share what information I turn up when I am able to conduct research. Thanks for the note. And while the locations of some of these bridges are unknown, I can tell you with 100% certainty that there is indeed one on Greely Chapel Road just outside Lima. Over the years, I’ve interviewed do many people during their annual Lima Lantern Tours and they have all pointed to the bridge at the far end of Greely Chapel as being the Crybaby Bridge. Of course, that’s not to say the bridge you mentioned is not yet another bridge…and one I’m not familiar with. So of course, I’m all ears! Is it the same exact version of the legend as the one attached to Greely Chapel? I noticed that you don’t have Clark County highlighted, and had I heard about the cry baby bridge in Pitchin, OH before the experience my friend and I had, I too would think it was just and over shared legend. About 9 years ago my friend and I were taking a drive through Pitchin. It’s in the country and it’s kind of pretty in the early fall. (Neither of us had ever heard of cry baby bridge at this point). Anyway, we drive over the bridge and both thought we heard something. But we assume it’s an animal and we don’t think twice about it. As the sun was starting to set, we decide to head back to Springfield and go the exact way that we came going over the same bridge. (From what I’ve heard you aren’t supposed to?) As we go over the bridge for the second time, my friends car loses its “get up n go” and starts to slow down. Then we heard the the same noise that we heard the first time driving over the bridge. It was definitely someone crying but when the car completely stopped we both swear we heard a cackle, (like the ones witches make in the movies) then cries again. The whole time my friend is trying to start the car we hear these cries. (We were too freaked out to “investigate”) Finally, we get the car started again and just as we’re driving off the bridge there was a shadowy figure that looked somewhat female standing right on the edge of the road by the bridge cackling and as we past her a dark figure flew across the windshield. When we got home we told some friends what had happened and that’s when they told us about cry baby bridge… Maybe nothing actually happened there, but something definitely happened that evening! You, my friend, are someone I need to talk to! Truth be told, the Pitchin Bridge is currently on the “Pending” list due to the fact that while I had some background information on it, I had yet to confirm the bridge’s location (some people even put the bridge over closer to Springfield). So since you’ve been there, I would LOVE to chat with you some more about it, and, of course, include your personal story on the site. Please drop me an e-mail at jim@strangeandspooky.com and we’ll get things rolling! Again, thank you for sharing your story and moving me a step closer to making the Pitchin Bridge “real”! OMG..the same happened to a car load of us one night. This bridge is in Logan County, outside of Bellefontaine, we went after midnight. We went across it and turned around but stubitly we turned the car off to hear better as well as the lights. Didnt take long and we all heard a cry and bushes move so I go to start the car and it wouldn’t start for a couple seconds but seemed like minutes. We where terrified and as soon as the car started we drove off and was to scared to look back. I’m getting scared just remembering this! Its on garlough rd I went there a lot as a teenager trying to scare my friends. I have heard many stories of people being chased by pickup trucks that devil worshippers were driving. And people in black hooded capes running out of the corn fields.the last time I went I seen a sign that appeared to be wrote in blood it said “we kill before pig inquire” don’t know what it means but scared me! Great story! Thanks for sharing! Since you seem to be very familiar with the stories associated with the bridge, did you ever hear any that involved a baby? We also have one here in Clark county Ohio just off of Lower Valley Pike in Springfield. Seen that Clark county was not highlightes, thought I would let you know. Brenda, is this the one that’s often referred to as the “Pitchin” bridge? That one’s on the “Pending” list since I have yet to confirm that one. But several people, including you, are confirming it does exist. Thank you! I’ve lived in Bethel Township for many years and have never heard of one off of Lower Valley. Any details? You missed Clark Co. Ours is located on Garlough in Pitchin. Thanks for the note! I’m getting quite a few notes about this particular bridge. I hadn’t been able to confirm its existence, until now! So it looks like there’s a big update in order. Thank you! I have been there many, many times. I live in Pitchin. I’d love to include your story here on this page. If you’re interested, please drop me a line at jim@strangeandspooky.com. Thank you! Pitchin is the real deal!!!!! Connie, care to share your story? There is also a Crybaby Bridge in Logan County located on Co. Rd. 56! This is one that I do NOT have on my list! So if you could pass along any additional information you might have on it, that would be a huge help. Of course, you’ll get full credit for it! Cry baby bridge in Pitchin is legondary. Aside from the tale of the mom and baby, it’s a notorious area for Wicken activity and some darker sides of witchcraft. The story I heard while in high school (late 1980’s) was that a woman was fleeing from her abusive husband and took their baby with her. As he caught up to her, she threw the baby over the bridge hoping it would have a better chance of survival than being beat to death by the father. He killed her and the baby drowned. It is said that you can hear the baby crying and also see the woman standing toward the end of the bridge. I been on the crybaby bridge in Pitchin. Really different place to be. When I was growing up going over the bridge there was people under it with the old fire barrels. Some say you can hear babies crying at different times. I haven’t been there in many years. Just wondering if you visited Egypt road? I can’t click on it to review what your thoughts are on it. My grandparents use to live down the street from there so I have heard pretty much all the stories. Pretty interesting that the bridge is still up but very hidden. If you do have thoughts on this one I would like to know thanks. I have indeed been to the bridge off of Egypt Road. It will be featured in an upcoming update, which is why you can’t click on it yet. Overall, it was one of the cooler bridges to visit because, as you mentioned, it’s set off the main road and isn’t used for vehicle traffic anymore and is sort of hidden in the woods. I found it surprisingly peaceful each time I visited, although it does take on a rather sinister feel to it at night. Of course, there was also the disturbing fact that they discovered the body of a woman who had been, I believe, murdered there. I’ve Ben at the pitchin ohios crybaby bridge.lets just say I wont go bk untill I can figure out how to reunite her with her baby..its not no game..its sad..if u go there playing around..I warned u..plus the farmers I kno that lives around that bridge is very protected over that bridge.. This is another one I don’t seem to have any information on. Care to share? from my understanding they may be all true. as the story goes a young woman who thought her baby was dead at birth threw her baby off a bridge only to hear it cry as it fell in the water. the mother started being haunted by the baby so she went to a witch to see what she could do to quit be haunted and the witch told her to throw another baby off a bridge so the first baby wouldn’t be alone.so she stole a baby and threw it off a bridge but it didn’t work. thinking she may be on the wrong bridge, she kept trying on other bridges with other babies till the day she died. I grew up in SouthCharleston. The crybaby bridge is famous. Almost everyone has their own story. I heard it was a ritural place for witchcraft. And not too long ago, like in past 10 years there had been people killing cats as to help with spells or something another. I personally have been on bridge at night with friends. It deffinetly gives you goosebumps when you hear sounds of crying. But I do think its something to check out. If anything youll get to see a really old bridge! The above story from “Bri” is quite interesting regarding the Pitchin version of CBB, which—by the way—-is on Garlough Road. Back when it was an old iron-frame bridge, I sat on it for about three hours one night talking (truly) with a girl I was dating at the time, That was around 1984. Noting happened. NADA. No strange noises or images. The cool thing about it back then was that it was such a deserted area that no one ever drove through there—including deputies. The word got out—however—that it was becoming somewhat of a hangout and deputies began to patrol it. Eventually the old bridge was torn down and replaced with a basic, two-lane open bridge, destroying forever the mysterious aura. I’ve been told that they now close Fudge Road at night because there were to many kids causing trouble for the people who live on the road. They were entering barns and garages and such. Sad that people ruin it for everyone. I’ve been to Fudge before, and I believe they have actually. This one lady on that road is CRAZY. She does not like people going down the street even if you’re passing through. I had no idea people were so crappy and trespassing…. Not sure about them closing the road at night (it is a public road, after all), but I do know that you are correct in that people have “ruined” this one particular bridge. I have heard nothing but horror stories (real ones, not the ones involving ghosts and crying babies) from people who have gone out there. So much so that I am still very hesitant to create a page for it on this site. But it’s very famous, so I think I’ll put one up and just put dozens of caveats that people should not visit this bridge under any circumstances. It’s just not worth the hassle. Granted, I visited the bridge back in 2004 when it was being considered for inclusion in Weird Ohio and didn’t have any problems. But I have received dozens of reports of people being chased down the road by very real neighbors who are sick and tired of people going out there to vandalize things and, as you said, ruin it for everyone else. Sad, really. So at this point, I think all of us who just a genuine love and interest in this bridge just need to steer clear of it, lest we be lumped into the category of “trouble-makers”, and nobody wants that. Just curious as to the one in Hardin county. The listing I have for Hardin County is just outside of Pfeiffer. It will be featured on this site in an update, coming soon! I personally have never been to cry baby bridge in Hardin County, but have came close to going. Cousin and i was driving down the road with my now husband and couldnt get passed gates and bushes. She has her own stories and what she has heard, but i dont have any. i now live kn Shelby County and wonder where that one is. i know of a big bridge with train tracks but wouldn’t know how to get up there. Ah yes, the Bloody Bridge! While it’s not currently on the Crybaby Bridge list (since there’s no mention of a baby in the actual story), it’s one of my favorite bridge stories. I mean, how can you not love something called the Bloody Bridge that even comes complete with, as you said, its own historical-type marker that recounts a tale of murder on the bridge? Great stuff! Now, of course, if you’ve heard stories about this bridge now having a crying baby attached to it, we might have ourselves a variation taking place! If so, let me know! Here’s the story as I know it. The story here is a couple of years old, but as far as I know, it hasn’t changed. There is also a crybaby bridge in Clark County. The one everyone always talks about is down the street from my house. Would this be the infamous bridge in Pitchin that everyone is telling me about? Care to share your stories about it? I’m all ears! Don’t forget the 2.5 Crybaby Bridges in Rogue’s Hollow! I’ve got a couple personal experience stories from my curfew-breaking teenage years. No worries: there’s a big update coming soon that will feature Rogue’s Hollow. But of course, I’d love to hear your stories! All that research and he missed the True Origin of Crybaby Bridge when on September 26th 1839 Andrew Hellman took a hatchet and cut his wife Mary Abel to death tossed his 3 children Louisa, John, and Henry off the bridge close to their home on twp 56. Henry is the only one that survived. Andrew was caught tried and escaped to Baltimore with the name Adam Horn. He finally hung on January 12th 1844 and is buried next to his wife and kids in Harrod Cemetery. Thank you for the note. However, while Andrew Hellman was accused of the murder of two of his children, Louisa and John, and the attempted murder of a third child, Henry, he did not throw them off a bridge. Rather, he was accused of attempting to poison them (Hellman denied this, though). Louisa and John did indeed die, but they were hardly babies–Louisa was 17 and John was 12. You are correct that Hellman murdered his first wife with an ax, but that took place after the poisonings. Interestingly enough, all of this came to be known after, as you mentioned, Hellman was captured several years later…after changing his name and murdering his second wife. Dave this would also be known as hatchet man rd correct??? My grandparents live on 49 an have told me of this legend for years now. I’ve also been to crybaby bridge an if you go there on Sept 26 at midnight you can hear a baby cry. Hey everyone. Suffering from some acute insomnia down here in Kentucky and came across this. Stumbled upon this page and the moment I saw the Garlough Road Bridge in Pitchin, my blood froze! Salyersville native here, but a large portion of my family lives in Springfield and South Charleston. I’m a frequent visitor, so I’m fairly familiar with the area. I too have an experience with this terrifying place. About a year and a half ago, some family members and I were heading to Springfield from Selma to visit with my uncle. The bridge on Selma Pike was closed for construction and in my ignorance, I identified Garlough Road as a much more suitable route than hitting US-42 to S. Charleston and taking SR-41 into town. We were en route to our destination around 8 that evening. Upon crossing the bridge, my aunt proceeds to tell me the folklore. Being the skeptic that I am, I dismissed it as nothing more than a good conversation starter. We were on our way back around 11 that night. I was driving around the curve/dip before you reach the bridge (it’s not visible until you fully negotiate the curve) and what appeared to be three people dressed in black robes and in face masks were standing right in the middle of it. Upon their sight of us, they began to run towards our vehicle. The road is roughly wide enough to accommodate one vehicle at this location, and it took me about three tries to get fully turned around. We were in a panic! Stupid kids I thought to myself…but before I began to take off, we looked behind us and nothing! It was like they had vanished. I personally didn’t think they would have had enough time to hide in the cornfields, and at that particular spot in the road, they couldn’t have had enough time to escape our sight. One of the most frightening experiences of my life. Us KY folk aren’t used to that. This all led to a call to the OSHP and a sleepless night. They eventually followed up with us per my initial request, but couldn’t find anything. I don’t take things like this lightly! I’m a graduate student at UK and struggle with accepting things I can’t see. Interpret this as you see fit, but if there’s ever a place that has some sinister history and apparently current activity, look no further than Garlough Road. In Montgomery County we have a cry baby bridge. It is in Bellbrook, OH. It is next to a park. What i have heard is that there was a slave who was impregnated by her owner. She knew her and her baby would be killed so after she gave birth she jumped off the bridge with her baby. I’m not sure if anyone said anything about the one in Van Wert county. Its on Mendon Rd. There is a whole bunch of lore on that area about the bridge, the lion statues at a cemetery, head stones that fall the opposite way that they are pushed in another cemetery, and odd stop signs. Wendy, thanks for the note! I don’t have any listing for a Mendon Road in Van Wert County. I do, however, have the Palmer Road Crybaby Bridge, which is in Mendon, Ohio. Could this be the bridge? If it’s not, then we need to chat because you’ve got information on a bridge I don’t have! Greene County.. Jacoby Rd…. No longer a brigde there.. Claims that a mother threw her baby off a bridge and you can still hear it crying at night. Just got another message about this bridge, which is one that I did not have in my database. Sounds like you’re familiar with the story, so I’d love to hear more. Did you ever visit the bridge? See anything? Feel free to e-mail me at jim@strangeandspooky.com if you prefer. And thanks again for writing! Thanks for the note. I currently do not have a listing for a bridge in Sabina, Ohio, so I’m very interested in hearing more. So please shoot me an e-mail at jim@strangeandspooky.com so I can find out more and get this bridge added to the list. Thanks again! I didn’t see anything mentioned about Jacoby Rd. in Greene County in between Xenia and Yellow Springs. I noticed a “Hyde” Rd. mentioned above and not updated, which is only one road away from Jacoby. However, I can’t think of anywhere on Hyde Road that there is a bridge/river. I actually live about a mile down river from this location. I’ve been there at night many times in my youth, but nothing eerie to report. Because this is a dead-end road, the locals are not very friendly to the trespassers from my remembrance (this is also the entrance to the very private lane that winds through the forest to the “infamous” 666 house whom had a homeowner that would shoot his gun at one’s vehicle if one got too close to his home(s). The only scary incident that I can recall is when a Greene County sheriff showed up and made my friends and I pour out an entire case of Little Kings. But, luckily – we didn’t get arrested or shot. It seems like I remember reading a story in the archives about this historic area (Goes Station) involving a flood and a stage coach being washed off the Jacoby Bridge (before it was a covered bridge maybe??) and all members of the family that was washed away survived except for “the baby” … Could be how the “legend” of “our” cry baby bridge originated?? Not real sure. Just thought I would share since I did not see Jacoby Rd. mentioned above. I might take a walk one evening up the bike path to that area and report back any happenings. Perfect timing on your note: the Hyde Road Crybaby Bridge is getting ready to go “live” this week! But as you mentioned, it doesn’t go over the water–it’s the newer covered bridge that goes over the bike path. Probably goes without saying when you’re talking Crybaby Bridges, but the story associated with the Hyde Road bridge is incredibly lacking, which is why I am VERY curious about the bridge you mentioned, which I DON’T currently have in my database. I can’t help but wonder if the story originated at your bridge and then, after it was destroyed, the tale migrated down to this newer bridge. Regardless, let me know if you ever take a walk up there and find anything. Even if you don’t, please feel free to shoot me an e-mail– jim@strangeandspooky.com–as it looks like you’ve put me on the trail of a new bridge, so I’d love to pick your brain a bit more. Hi Jim …. I know of the covered bridge that goes over the bike path. In fact, it was just restored and looks lovely. I am a native of this area and have never heard of any reference to the Hyde Rd. covered bridge being haunted much less being haunted by a crying baby. It is very well known in “these parts” that Jacoby Road is the “cry-baby” bridge of this area. I can request any occurrences on my facebook page of any stories that may be helpful for your database as about everyone I know have been there at midnight waiting to “hear the baby crying” and drinking beer … lol …. It seems to me that I read about the incident where a stagecoach was washed off “the” bridge with a family aboard while doing research on the Shawnee Indian history of the stretch of river between Goes Station (Jacoby Rd. bridge) and Old Towne (area where Simon Kenton ran the gauntlet “twice”) and ultimately escaping from being held prisoner by the Shawnee during the revolutionary invasion of this area. I’ll try to do some research to find out where this happened and try to elicit some stories for your “cry baby” bridge project! Thanks, Lori! That would be great! The more I hear your stories, the more it sounds like Jacoby was the original bridge and when it was demolished, Hyde became the new Crybaby Bridge. That being said, I don’t have any concrete stories about the Hyde covered bridge being haunted. It would appear to be all anecdotal stuff associated with the “spookier” bridge before it was restored. But good urban legends never die, so I think those stories just got attached to the new bridge once it went up. Actually – No; Jacoby Road “dead end” is the cry-baby bridge spot (even though there isn’t a bridge there anymore) … We would all still go to the “dead end” to wait for any weird happenings. I’ve heard many stories of people experiencing paranormal events, I just personally haven’t experienced anything “there” … Hoping we can add some stories for this locale. People still visit this spot in hopes of experiencing something paranormal to this day. No one that I know has confused “Hyde” Rd. bridge with “Jacoby” … Perhaps Hyde Road bridge is haunted too?? lol … This area is known for paranormal activities. A lot of history here! Lori, in a weird way, it’s all starting to make sense now. Based on what I’ve encountered while researching some of the other bridges (and urban legends in general), when people go looking for a certain haunted landmark (bridge, house, etc) and can’t find it, they pick the next closest landmark. From what you’ve told me, it would appear that Jacoby was the original Crybaby Bridge and that, even when the bridge came down, locals still knew about it and would still go there. But, generations later (and with the evolution of the Internet), new people (not necessarily locals) who knew nothing except that they were looking for a bridge, would bypass the Jacoby Road dead-end and keep looking for a bridge. And wouldn’t you know it, there was a creepy old bridge right down the road on Hyde Road. I think when that bridge was replaced, the stories just moved to the new covered bridge. I think that’s why the covered bridge does not have any details regarding the haunting. Just a thought, anyway! I for a fact know somethings not right with the crybaby bridge in pitchin. Im 37 and when i was 16 i was on house arrest and snuck out of the house to go with some friends. We all go.. Get out of the car to listen to this so called baby crying.. We all heard the crying and raspery voices.. We start to get scared and go back to the car ehen plain as day we hear screaming get off my land.. We hall tail to the car with hearing footsteps behind us. One of our friends stopped to turn around to see what was going on and on the other side of the bridge you could just tell it was an old time truck start up. We all get in the car and leave in a very big hurry. The truck was following us.. My friend flipped the car and the whole front end was smashed in so we had to climb out the back window.. We all escape with minor cuts and bruises. But the truck vanished into thin air.. Needless to say we all ended up in the hospital and from there i was taken to detention center and ive NEVER been back.. I grew up in Clifton Ohio and my family is all from the Pitchin area, my grandma and uncle live 5 minutes from the Garlough Road Crybaby Bridge. I heard all the stories from various family members growing up about the area and how haunted it is. I have several family members who have had runins with the individuals performing dark occult practices that once took place in the old farm house on the hill overlooking the bridge as well as dealing with various other supernatural elements in the area. I never really believed them until some friends and I started exploring the area once we started driving and we’ll into my mid twenties. I myself along with friends have heard strange things and seen stranger things along that dark stretch of road. The last time I went out there was about ten years ago with some friends who had talked me into going after I have told them about the bridge. We drive out there, stop the car on the bridge, shut off the car, get out and start exploring. For several minutes nothing happens, then we start hearing sounds of movement down underneath the bridge, we look and call out but receive no answer, at this point many of us are beginning to feel very uncomfortable due to loudness of the noises. At this point we hear a terrible scream and we all panic and run towards my car, I try to start it but nothing happens, almost as if the battery was dead at which I begin to panic, then suddenly something that seems to be very large begins to climb on the hood of my car, the front end dips down and the hood indents, the outside of the windshield begins to fog as if something or someone is heavily breathing upon it. All of us are completely terrified at this point and I am frantically trying to start the car and get the he’ll outta there. Suddenly my car starts and whatever the presence was simply vanished, I was never so scared in my life. I have been chased by other vehicles out there, seen creepy must forming and rolling across the fields at night and have witnessed dark cloaked figures in the fields and woods and I have never been more terrified than I was that night. If you go out there stay in your car, stop for no one and and don’t play around, Pitch in can be a dangerous place. The Cry baby bridge in Pitchin you do go down Garlough Rd but you actually make a left hand turn onto another road to get to it. We were just there and I didn’t see a road sign for the road we turned down.